Scenario Menu – The Scenario Explorer is an essential feature that enables the user to create, edit, modify, run, and compare any number of “what if” modeling scenarios with little extra effort. Exchange Menu – Use this to Import or Export model data from or into an InfoSWMM SA project. 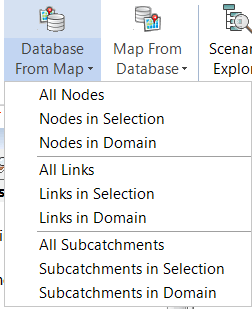 Updating the DB from changes made to the Map of InfoSWMM SA. 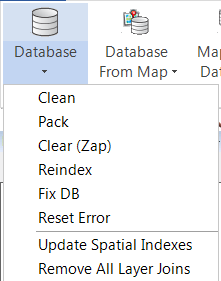 Updating the Map from changes made to the DB of InfoSWMM SA. The Scenario Explorer is where InfoSWMM SA allows the user to create, delete and modify scenarios. The Scenario Explorer is what allows the user to create “what if” situations throughout a sewer/storm/combined system. Edit allows the user to select any of the scenarios created in an InfoSWMM SA project and make it active. Once a scenario is made active, each of the three facets that comprise a scenario (facility sets, data sets, simulation sets). Once the Compare Data Scenarios dialog box appears, you will see that the Active scenario is selected. You can compare the Active scenario and another scenario in a model. Alternatively, you can select another scenario other than the Active scenario to compare to another scenario. A data set is one of three components that comprise a scenario. Data sets provide the capability to take a one-time “snapshot” of data (database information) in the active model and store that information separate from the network itself. In essence, InfoSWMM SA creates separate database tables for each data set created, allowing the user to manipulate the database characteristics of the data set, separate from the “Base” data set. Once new data is stored in a data set, it may be reloaded back into the active model (via a scenario) at any time. Use this to import data from external files into the InfoSWMM SA project database. See: Import Manager Dialog Box To learn more about the Import procedure click here. Choosing this option launches the InfoSWMM SA Export Manager dialog box. Use this to export data files from InfoWater SA to other applications. See: Export Manager To learn more about the Export procedure click here. Import any version of a SWMM 5 INP File. Export a hot start file for SWMM5 or InfoSWMM SA based on the current displayed simulation time in attribute browser.